The widespread availability of the internet, which provides a never-before-possible power for information access, and transmission and reception of messages in every medium. These trends define the new space in which we live, and, armed with both the necessary research and a knack for explaining a wide range of interlocking ideas with clarity, the adventure begins. Professor Wellman’s work helps to make the case that the old idea of groups has become the new idea of networked individuals. At first, the distinction may seem, well, academic. Then again, consider the number of people with whom you interact every day or every week. If you lived in, say, Europe of the 1800s, most of these people would share proximity, language, culture, friends, family members, transportation routes, and more. Today, those ties are not fixed in a group. Instead, the connections are more fluid, more varied, more precisely defined by the individual and not by his or her membership in a group. Boundaries are permeable. Connections may or may not be long-term. Something’s lost here in terms of long-term friendships and relationships with family members (some or many may no longer live nearby), and something’s gained in the richness of more diverse lives. I remember working for a client named Steve, who carried his cell phone in a case the size of a lunchbox, and I remember working for a successful entrepreneur whose phone was built into her car’s dashboard, like a car radio. Both date back to the 1980s. At the time, not more than a few thousand people owned mobile phones. In fact, that first decade was slow going, but after 1995, the trajectory is very nearly a 45-degree angle, running uphill to over 300 million cell phones today, and more on their way. Fully 83% of the U.S. population owns a cell phone. Those stats aren’t surprising, but the combination of internet growth, changes in our individual behavior, and the fact that so much can now be accomplished any time and anywhere sets up the story. Public and private spaces begin to blur–think about the number of people you saw on TV during the inauguration who were checking their cell phones. Nowadays, it’s perfectly acceptable to work just about anywhere–and the need for offices is beginning to fade, certainly for creative workers, and now, for many other types of workers, too. Companies are shrinking or closing their offices and instructing employees to conduct their business from home (in one case, a friend was told to “take the office furniture because it is no longer needed.” The authors consider the idea of “place-to-place” networks to be hopelessly old-fashioned; these days, it’s all about “person-to-person” networks. As family composition and roles have shifted (women working outside the home; household free time spend on digital devices; the individual activity of computing; a 25% drop in the average number of hours devoted to housework since 1965), we interact in different ways that don’t always connect generations effectively. For example, the authors describe a young woman who communicates daily with both of her parents while they complain that they never hear from her. What they want is personal touch. What she wants is regular contact. These are not the same, and as a result, there is conflict. When attempting to explain the changed world of journalism, the explanations do not come so easily, in part because it is so very difficult to understand what’s really happening and why. With so many people writing and communicating on the web, in so many different ways, the old and traditional role of a reporter is difficult to outline in the new world. Where does credibility or experience or context fall? Do we perceive more value in a local person telling a story on the spot in, say, the changing Middle East, or an experienced reporter who provides the experience and wider view? What about people who comment on the work of the local observer or the reporter? Not all are pundits; many are simply trying to understand what happened by reviewing many sources and many stories. And so the layers are applied, one after another. It’s not just that there’s a remarkable internet or an astonishing Wikipedia, and it’s not just that we’re able to access this material and respond to it at any moment from any location. It’s these phenomena mapped over a much-changed society and dramatically shifted individual behavior patterns. It’s all one large idea, and it’s time that we begin to think about these changes in a more holistic way. The data is here… enough of it to get the conversation started, anyway. And in this iteration, the writing and smart and the analysis is sharp. It was written about 18 months ago–one of the ironies of the book writing, publishing and reviewing process is that it takes more time than our triple revolution deems reasonable. 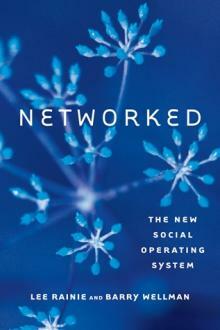 A networked book is an open book designed to be written, edited, and read in a networked environment. It is also a platform for social exchange, and is potentially linked to other books and other discussions. Wikipedia is a networked book.